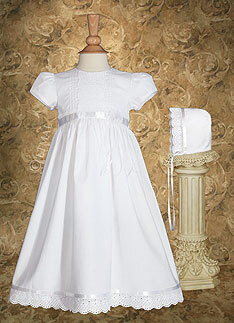 Darling 24" cotton baptism dress trimmed with pin tucking, lace and ribbon. Includes matching bonnet. Hand made of 100% Cotton Broadcloth. Hand wash. Shipped with plastic hanger and poly bag covering. Slip available separately. Heirloom Preservation Bag recommended for long term storage.